More highbrow than how-to, these 10 chefs’ books from Italy, Spain, France, England and beyond are the current must-reads for the food-obsessed. Successful cookbooks usually end up with sauce-splattered pages, but some of the most thrilling new volumes aren’t likely to be taken into the kitchen. More highbrow than how-to, these chefs’ books—many published overseas and not yet translated into English—are coffee-table-big, quite expensive (French chef Marc Veyrat’s Encyclopédie Culinaire du XXIe Siècle is around $425) and involve complex methods and obscure ingredients. And they’re the latest must-have titles for the food-obses­sed. "Nobody’s suggesting that readers try a lot of this stuff at home," says Nach Waxman, owner of New York City’s Kitchen Arts & Letters, which stocks many of these books. "These chefs are trying to be inspirational. They’re trying to get the juices flowing." Waxman adds that it’s not surprising that so many of the books have not been picked up by publishers in the U.S.: "American publishers tend to play it safe. But some of the ideas in these books are going to emerge and become part of the mainstream, both in restaurants and in home cooking." Books are available through Kitchen Arts & Letters (212-876-5550 or kitchenartsandletters.com) and Le Sanctuaire (415-986-4216 or le-sanctuaire.com). Translated into English, this three-volume series (covering the periods 1983–93, 1994–97 and 1998–2002) is a reflection on the methods, techniques and concepts that made El Bulli in Roses, Spain, an international phenomenon. It chronicles chef Ferran Adrià’s transition from Catalan-based cuisine to the hyperexperimental style that made him one of the world’s most famous chefs, and provides fascinating details about the groundbreaking scientific processes used in the El Bulli kitchen. Known for his high-tech cooking at the Fat Duck in Bray, England, Heston Blumenthal takes on traditional food in his new book. He travels around the world in search of the best ingredients, tips and techniques for cooking the most beloved—and abused—dishes, like roast chicken, spaghetti Bolognese and steak. While he insists that perfection is ultimately impossible, he comes up with his own ideal versions of eight classics. The authors asked 40 top chefs (Paris’s Alain Passard and Manhattan’s Wylie Dufresne, among others) to contribute their egg-based recipes, then organized the book based on which part of the egg is featured in each dish. Intricate cooking techniques, obscure ingredients (like lotus flower) and gallery-worthy photos add up to a conceptual, almost dreamlike homage to the egg. Japanese food journalist Kazuko Masui describes how, in 2003, she fell in love with Michelin-starred chef Yannick Alléno’s cooking at Paris’s Le Meurice. Gorgeously photographed and written entirely in French, the roughly 80 recipes, which often take as many steps to make, are organized by season and framed by thoughtful, detailed— if occasionally pretentious—observations from Masui’s vantage point at Le Meurice’s table No. 5. Named after chef Martin Picard’s Montreal brasserie, Au Pied de Cochon, this self-published, whimsically illustrated cookbook is a spirited tribute to all things fatty, porky, ducky and starchy. 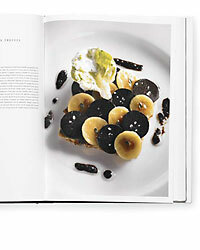 Written by Jean-François Boily with recipes from Picard, the book is a best seller at Manhattan’s Kitchen Arts & Letters. Parisian baker Eric Kayser provides meticulous tart recipes for all seasons, supplemented with step-by-step instructions for creating 11 types of pastry dough. Each recipe comes with a tight shot of the sometimes pristine, sometimes delightfully gooey results. This stellar Spanish-language collection (the title translates as The Challenge of Spanish Cuisine) explores the evolution of Spanish food over the past 30 years. The book is divided into chef "courses": appetizers from masters (Juan Mari Arzak, Pedro Subijana); starters from a second wave of stars (Sergi Arola, Dani García); main dishes from up-and-comers; and desserts from top pastry chefs (Paco Torreblanca). From Marc Veyrat of La Maison de Marc Veyrat in Veyrier du Lac, France, comes this three-volume, French-language manifesto detailing his vision for 21st-century French cuisine. The first book reflects on his early years (including how he came to wear his iconic wide-brimmed hat) and has recipes for revamped classics. The second one is a guide to the herbs he famously forages. The third includes his newer, ultramodern recipes. Paris star chef Pierre Gagnaire has had a 40-year cooking career, starting with a kitchen apprenticeship at age 16. His culinary biography (its title loosely translates as "lucid and playful") sets up his life as a scavenger hunt, viewing each restaurant where he worked as a stop to gather new finds. Witty essays in French by writer Jean-François Abert and terrific photos complement the more than 40 recipes. This oversize volume (translated into English) begins with a dialogue between the authors, brothers Massimiliano and Raffaele Alajmo, as they describe working at Le Calandre, their family’s restaurant in Padua, Italy. Lavishly photographed (and impossibly difficult) recipes—along with the chefs’ doodles illustrating their concepts and inspirations for each dish—help to illuminate the brothers’ regionally based but cutting-edge style of cooking.